The Soaring Sheep: What a week! She's been an utter star and so brave. We are so proud of her. Then, as if dealing with sleep deprivation and a miserable pre-schooler wasn't enough, the Universe decided we needed another challenge. On his way home from work on Friday my DH's car was hit. He's fine and so were the people in the other car but our old people carrier may not recover from it. We're waiting to hear back from the insurance company to see whether they will fix the broken radiator or just write it off. 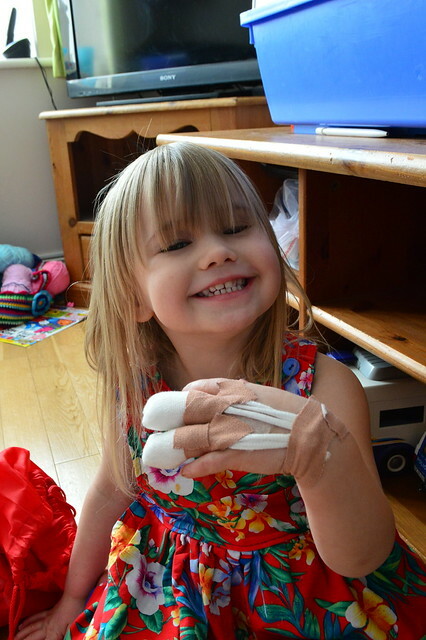 And THEN, on the same day, my baby girl bumped her fingers and they started bleeding so she and I had to take a taxi to the A and E an hour away where she'd been treated so they could take off her bandages and check nothing serious had happened. Thankfully she was ok and my Dad was able to give us a lift home. It was a very long day. We spent Saturday trying to stay awake and then on Sunday Mr Soaring Sheep went shopping for replacement car seats which was far more of a challenge than you'd have thought. Yesterday we went back to the hospital for another bandage change and then this morning Mr Soaring Sheep left for work and won't be home until Friday night. It's half term, I'm shattered and I've got 4 childen to look after on my own. I might be a little crazy by the end of the week lol. Thanks for sticking with me. I'll be back later with some photos of what I've been up to outside of hospital visits and sleeping! Oh my goodness, what a rough week! It sounds like you and your little cheerful trooper are keeping it together despite it all. Best of luck, and quick healing to the little one! Oh no, what a challenging week. So glad your little girl is feeling better! Here's to a quick recovery for her and a peaceful rest of the week for you! Hugs! You definitely deserve a do over week!! Hope all is even keel at the moment. oh my, I hope she heals up quickly!! That must have been very stressful. My gosh. I'm glad everyone is generally okay. Your little one is a little warrior. I'd be moaning from the discomfort.